Birds can always turn up in the most unexpected areas and at the most unlikely times but there are always certain sites that are worth checking. The Trapping Area. This is a Large area to the north of the Observatory. It was originally excavated for shingle in the early 1900s which has resulted in the area being about two meters lower that the surrounding areas. This is the area where our ringing and mistnetting takes place. The Desert. A flat, exposed area to the east and north-east of the Observatory with dense bramble clumps and a few willow which is can be good for pipits, chats and wheatears. The Moat. An excavated shingle bank and ditch around the Observatory which holds willow scrub and bramble bushes. Our Heligoland trap is here and the bank is a good place for visible migration. The Sea. 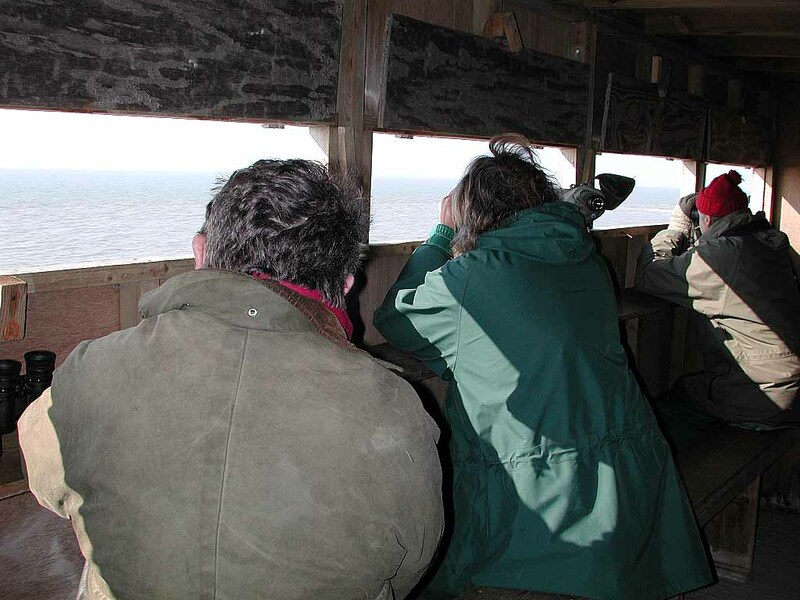 Seawatching can be good from anywhere along the beach and the Observatory provides two hides for Friends and guests. Keys are available from the Observatory. The southern shore is best in spring but the northern shore is often better in autumn. The Patch. An area of disturbed water good for seabirds overlooked by a hide for the use of Friends with a key available from the Observatory. 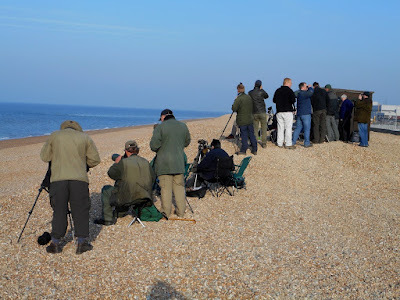 Dungeness is situated at very nearly the narrowest part of the English Channel and is thus ideally placed for observing birds moving into and out of the North Sea. Large movements of seabirds are always associated with onshore winds though things can and do happen when conditions seem less favourable! Seawatching can be interesting at any time of the year though Dungeness is probably unique amongst major British sites in being more productive in spring. A hide for Friends and guests is sited on the beach near the eastern corner of the power station wall with a second hide overlooking the Patch. Keys for the hides are available at the Observatory. The Dungeness Bird Observatory was formed in 1952 and bird ringing has been taking place on a more or less daily basis since that time. There is an obvious bias towards migrating birds so that the peak activity occurs in spring between March and May and again in autumn between the end of July and early November. In those early days much of the trapping of birds was in Heligoland traps with up to nine of these large structures in use. Nowadays the majority of birds are caught in fine nets suspended between poles which are designed to catch birds in flight. The skills necessary to become a ringer can only be learnt by practice under the close supervision of experienced ringers. Ringers have to undertake a period of several years of training before being able to qualify as an 'A' permit holder. A British Trust for Ornithology (BTO) ringing permit is a legal requirement in order to ring in this country and must be renewed annually. Named after the island on which these traps were first designed and used, the Heligoland Trap is basically a large funnel made of netting and ending with a collecting box where birds are finally caught and removed. 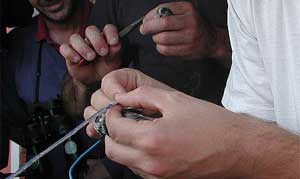 In order to catch the birds it is necessary to actively move the birds into the catching end of the trap but for the rest of the time birds are free to come and go at will. The major advantage of this type of trap is that they can be used in any weather conditions. In the 1950's the first mist nets were used in Britain to catch birds and these now provide the main means of catching birds for ringing. This can be a very effective method of trapping mainly small birds but birds can only be removed safely by experienced ringers who have received special training. They do have serious disadvantages however, the main one being that they cannot be used if it is wet or windy - an all too common scenario at Dungeness.